We lived in Los Angeles for five years when I was in graduate school, and I just couldn’t wait to get out of there as soon as I passed my doctoral exams. I’m having a hard time remembering now what I had against it, because this time, I loved LA. Through Airbnb we rented a cute Spanish-style house in Alhambra that was just big enough for all seven of us to do the stuff we like to do. And the family threw me a big wonderful birthday pool party bash! With delicious Greek food, of course. I wish I’d taken a picture of Jim’s amazing zebra cake… not Greek at all, but just the thing when your family is visiting from Africa. 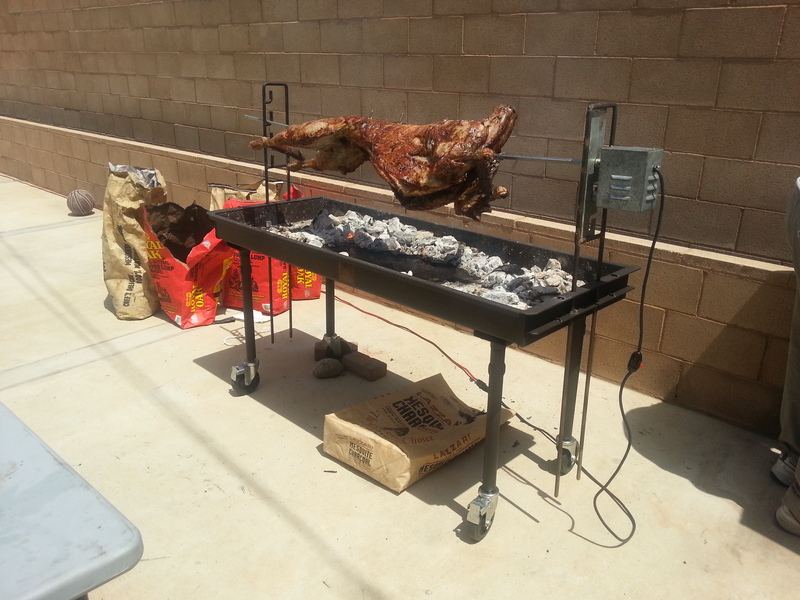 Roasting a whole lamb. Happy birthday to me! I hope the food is not this good in Costa Rica or I’ll have to buy all new clothes. This entry was posted in Family, Food, USA and tagged Alhambra, Los Angeles. Bookmark the permalink. 2 Responses to I love L.A. Happy Birthday Lorna. Best Wishes.